I certainly hope that each trader or hopeful trader satisfies themselves as to the merits of trading, keeping self-delusion and misguidedness to a minimum. Be honest with yourself - do you really understand what you're doing? Prior to beginning to trade, a person needs to demonstrate that their method will work. This is not something that should be done after you've started trading. Many people who are much smarter and more talented than any of us, have failed at trading. I daresay these people had a much deeper understanding about financial markets than any of us do. You might be tempted to dismiss their failure with some explanation made in hindsight (or, more likely, regurgitating someone else's hindsight), but ask yourself - how much do you really know? Human nature is to brag about winning and keep quiet the losses. But of everyone posting on these trading forums, the only person who is going to know with certainty the overall result at the end of his or her trading career - is the individual person himself. Be it a short lived career of three months or a span of several years. The situation with financial markets is more complicated because a big portion of the available odds are the result of natural processes beyond anybody's control. This is dangerous because people start inventing their own odds without the possibility of knowing whether they are accurate. Again, for each of us posting and reading these forums, there are and have been many, many people substantially more intelligent and knowledgable who dedicated their waking hours to trading, and failed. This fact is something that should not be dismissed. Any aspiring trader needs to think twice about whether it's really something worth doing, and any existing trader should take pause. Losing money through trading stings in an amount directly proportional to your desperation to win. If you are not desperate to win, and you realize that at the end of your 3-month, one year, or ten year trading career, you may have a negative P/L, then who can fault you for trading? Is it possible for you to send me a e-mail as a fellow Canadian and someone trying to get through the quagmire of info, lies and deception out there. I would appreciate any guidance you can offer. cnSmith .. I don't see the option in your profile to email you? Send me a PM with your email address. This past week was an interesting one performance wise for me. Friday, being US employment report day, I knew would be a tricky day of trading because often the day has high volume but can be very choppy (non-trending). And this Friday did not disappoint. I fell out of sync with the pace of trade during the protracted 4 hours of sideways chop which ran through the middle of the pit session. I had the directional bias right, but the higher level of choppiness mid-day was challenging for me. Also, Friday came on the heels of a two day win streak, where I had two trading days in a row without one losing trade, so I knew going into Friday the win streak was on borrowed time. I started the day with two nice winning trades, but things turned south on me during the directionless mid-day chop phase and I fell into a losing streak that lasted until the last hour of trading, where I pulled the nose of the plane up and finished the day with a couple of wins going into the close. This left me with what I will call a break-even day of trading. I ended with a net gain for the day, but just barely. If not for the last two trades of the day, it would have been a losing day. OK so what can we take away from Friday. Note, by keeping the Max Loss per trade reasonably low, I avoided having a huge single loss from which it would have been impossible to recover. Also, note I kept the avg W/L ratio near 1, again making sure to protect from incurring a large single loss. This is defensive trading, and the lesson here is: control your risk at all times no matter what. This week's results advanced the daily win streak to 18 positive winning days in a row ended with Friday's break-even day. Taking the last 5 weeks into account, introduces 1 losing day along with this week's 1 break-even day (out of 25 days total) for a daily win% of 92%. I have gone through this sharing process primarily to challenge the absolute claims made by the random walk theorists. Also, with Jim Kane's insightful commentary I hope this has been an instructive example for traders interested in advancing their trading success. Please keep in mind, trading futures involves substantial risk of loss and is not suitable for all investors. As always, past performance is NOT indicative of future results. Thanks for posting all that, PT. I think it is really helpful for the readers to see the numbers so well laid out. As I've said in many of my writings, if one goes into a pizza business, it's fairly easy to find stats on what other similar pizza places in the area might be making. If you open up a convenience store, same thing, and so on. But for small, independent traders, it's very, very hard to get any reliable numbers, and hence very hard to create a plan that is based on any accurate data. You are providing such data here, and I hope everyone struggling to create a business plan for trading realizes this. And as I said before, it is amazing how closely your numbers reflect my own research and data. As some may recall, PT and I started this conversation in another thread that I started trying to point out what I thought realistic numbers looked like, and that they weren't the 20 or 30 point average winners some were claiming (and saying you must be an idiot if you don't get). And I'll mention again, what PT has shown here, in my opinion, is a slow and steady, consistent approach that will tend to have a very low variability. As discussed by both PT and myself, management (risk and trade) are a key factor in this. The odds of this kind of style 'blowing up' are very low in my opinion. As a closing remark, I have a 'test' I joke to beginners about. I call it the 'vendor test'. If you look at the potential stats for your plan and then imagine if you were a vendor trying to promote your 'Learn to trade in a weekend' seminar with those stats, if you think you'll fill the room, the plan is worthless. If you think you'll make a good amount of money doing the seminar, the plan is still likely useless, and if you are positive you won't have a single person show up at the seminar, your stats are in the ballpark of being something actually realistic. Just something to think about. Great job, PT, I never get tired of looking at your stats. Since I stepped off the 'random walk is nonsense' bandwagon I will not comment on that, but I did find a good read for those that want to hear what a highly respected long-term trader has to say on the subject. I came across this a little while ago, and thought I'd list the reference. If you've ever traded or heard of the '2B' setup, then you likely know who 'Trader Vic' is. He has a recent book out Trader Vic on Commodities. Chapter 6 is entitiled 'A Challenge to the Random Walk Theory', pages 45-66. It is worth looking at if you happen to have access to the book. If it is one thing I have learned after 12 years of trading is the bottom line: you need to have a proven and reliable system to trade the futures. The system removes the emotion and will be the key to your long-term success. Hey, cba. I checked out that EminiViper.com page. Very impressive. Seems like they don't have any losing days, or even losing trades (or do they not post those?). Is that so? If not, how many stop outs or false signals are you seeing on an average day? It doesn't mean much to me to see winners, I am more interested in the losers I have to take to get those winners. Also, are you the owner of EminiViper.com, or do you work for them? If not, what is your association? If I don't ask, that will likely be the first question from everyone else. Thanks. The videos are intended to show the NQ Emini trades that are triggered by the system each day. Currently the system is designed to issue trade signals only the Nasdaq Emini. In addition to the Viper indicator, the system uses a combination of guidance charts and a trading chart that very rarely has a losing trade. With all of these constraints, it should be noted however, that there are not many signals that trigger in any given trading day. Depending on the volatility - usually one or two trades may trigger - a busy day would be 3 trades. The entire trading system is not shown in the videos; however, all of the details regarding these trade signals are shown in an eBook and training videos. The actual trade signals themselves are analyzed in real-time in the live Webinars. The entire goal of this system was accuracy - not catching every trade. In answer to your other question, I have been a trader for a little over 12 years now, I am a partner in the firm; and was involved extensively in developing, actively trading and back-testing the Viper system over the past year and a half. Thanks for the response, cba. Wow, those are some incredibly impressive stats. Given these are intraday trend trades, it's almost incomprehensible to me. 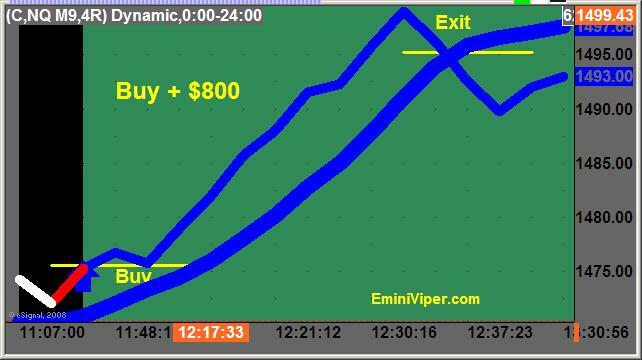 My style is intraday trend trading, and with the 3 to 5 to 1 or sometimes higher reward/risk profiles I'm happy anywhere in the 30% to 50% winners range. I have a few more questions. Is there a way to follow along and see live trade signals the moment they develop, on a trial basis? The web site mentions visiting a live webinar for a day. Would one see live signals in time to act, or only after they have started? What if no signals are generated that day, can someone try another day? It's very hard to evaluate a system with a one-day trial, especially one that generates only a few signals. Next, what is the difference between live webinars and live trading room, as far as signals given in real-time? Also, if one signs on to your room and gets all that training, does that do any good without the software? What is the cost of the license, since the website doesn't specify this? I'd love to follow along real-time for a period and evaluate your system, but I'm not sure you have any provisions where I could do that without laying out money first. Again, if I don't ask all these questions, someone else will. Since I'm probably the longest-winded character at this forum, I figured I'd just get the ball rolling. It's not often I hear about a system that has almost no losers at all. Lastly, if we go much further with this discussion it may be appropriate to move it from this thread to one you or someone else could create in Trading Advisory Services.